My name is Sao.I will be your guide during your trip .You are looking for the best holiday yet? - visits to special places in Ayutthaya colour life and a taste of real Thailand. 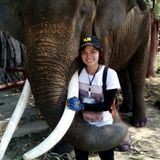 I have been a qualified tour guide 2 years and have in-depth knowledge of around thailand, and the best places to visit as well as other parts of the country.I love taking visitors to see the best places in Thailand.If you have children with you.please ask me for special family friendly itineraries. In fact I can suggest itineraries to suit any pocket - Thailand doesn't have to be expensive! Find out more - just drop me a message.If you love the outdoors, Ayutthaya and Bangkok is brilliant for walking and cycling , lots of places to walk and bike freely, wide-open views and footpaths everywhere. Much of our coastline can be walked and biking. Trips created by jareya s.